Volume One of this Encyclopedia deals with the physical and chemical dimensions of the Earth system, including for example the atmosphere, the oceans, the cryosphere, and those aspects of the land surface particularly relevant to interactions with other components of the Earth system. It focuses on the most dynamic aspects of the system, on the factors and processes that produce change, and on the programs and individual scientists most concerned with measuring and understanding change. The volume begins with a group of extended review essays, followed by shorter articles on various aspects of the history, current state, and possible future states of the Earth system, including the interactions among the components of this system. 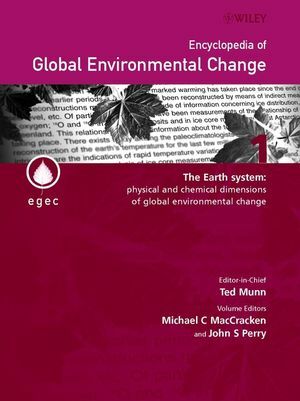 This volume represents a uniquely valuable source of focused, timely, and authoritative information relating to the issues of global environmental change. It has been constructed broad enough in scope to illuminate every corner of the relevant geophysical sciences, while remaining concise and readily usable by the non-specialist. Preface to the Encyclopedia of Global Environmental Change. Models of the Earth System. Model Simulations of Present and Historical Climates. Projection of Future Changes in Climate. International Organizations in the Earth Sciences.